Bring water to a fast boil and add salt. Add pasta and cook for 8 minutes, stirring occasionally. Drain and serve. Chop the onion and fry in a saucepan with the oil. Add chopped tomatoes and leave to cook for 3 minutes. Add the green olives cut into rings and remove from the heat, adding salt and pepper to taste. 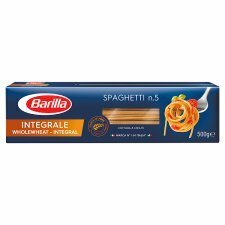 Cook the Barilla Integrale Spaghetti in plenty of salted water, drain when "al dente" and add them to the tomatoes and olives. Serve with a sprinkle of rocket.